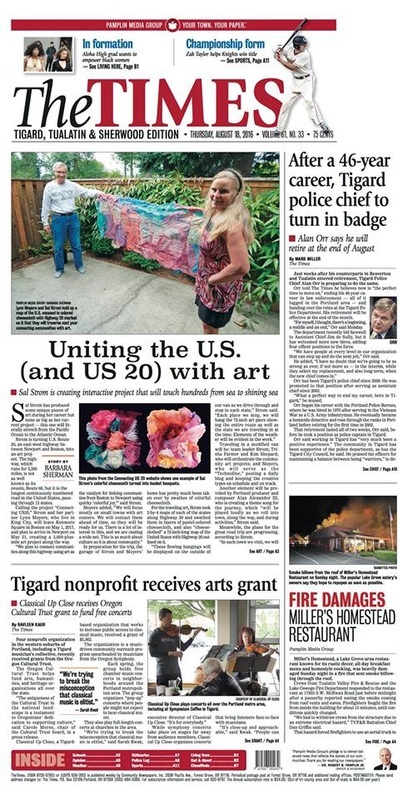 The Tigard Tualatin Sherwood Times recently ran the following article about our exciting new grant from the Cultural Trust of Oregon. Four nonprofit organization in the western suburbs of Portland, including a Tigard musician’s collective, recently received grants from the Oregon Cultural Trust. The Oregon Cultural Trust helps fund arts, humanities, and heritage organizations all over the state. “The uniqueness of the Cultural Trust in the national landscape is a testament to Oregonians’ dedication to supporting culture,” said Carole Morse, chair of the Cultural Trust board, in a press release. Classical Up Close, a Tigard-based organization that works to increase public access to classical music, received a grant of $5,562. The organization is a music-driven community outreach program spearheaded by musicians from the Oregon Symphony. Each spring, the group holds free chamber music concerts in neighborhoods around the Portland metropolitan area. The group organizes “pop-up” concerts where people might not expect to hear classical music. They also play full-length concerts at churches in the area. While symphony concerts take place on stages far away from audience members, Classical Up Close organizes concerts that bring listeners face-to-face with musicians. This grant will keep the organization afloat, helping to ensure that they’ll be able to continue the free concert series during the spring of 2017. While the concerts are free to the public, the organization has costs ranging from publicity to rentals to paying their musicians. They still hope to raise more funds to cover all their costs, because they are committed to keeping the concerts free. “We’re trying to make classical music accessible to as many people as possible,” said Kwak. PORTLAND, OR., March 17, 2016 – As part of their Rising Tide Grant Project, All Classical Portland enjoys a second year as the Official Media Sponsor for Classical Up Close 2016. Organized and performed by musicians of the Oregon Symphony, this series of free chamber music concerts takes place between April 23rd and May 6th with performances throughout the Portland Metro area. Concerts include informal, full-length performances in neighborhood venues as well as buzz-worthy “blitz” performances: thirty-minute concerts in unlikely venues and at unusual hours, meant to meet people where they live, work and play. This year’s venues include Trinity Episcopal Cathedral, First Congregational United Church of Christ in Vancouver, American Legion Post #134 and two performances just for kids at the Beaverton Library. China Forbes of Pink Martini makes a special guest appearance in the series on April 26th. Last year’s sponsorship by All Classical Portland really made a difference in helping us get the word out about our events and we’re thrilled to work with them again this year. Rising tides really do float all boats! We can’t imagine a better partner than All Classical Portland to further our goals of celebrating great music and connecting to a wide community of music lovers in a personal and immediate way. Our festival of free concerts is designed to bring music to people where they live, work and play, and of course that is what All Classical Portland does every day, both on the radio and online. Some of the finest musicians I know are putting their music where their mouth is. When they say they want to break down barriers to people seeing, hearing and experiencing classical music - they mean it. They don't just offer free access to their music making, they actually take their art and craftsmanship on the road, and play at the local City Hall, ice cream parlors, coffee shops, bookstores, and libraries. So, what's your excuse for not getting up close to this great music? See you there! All Classical Portland is Portland, Oregon’s classical radio station. Established in 1983, our mission is to advance knowledge of and appreciation for classical music; to build and sustain culturally vibrant local and global communities around this art form; to reflect the spirit of the Pacific Northwest; and to foster integrity, quality, and innovation in all that we do. For more information, visit www.allclassical.org. ​Click here to download a PDF of this press release. PORTLAND, OR—Classical Up Close (CLUC) is a recipient of a $5,000 grant from The Fred W. Fields Fund of The Oregon Community Foundation (OCF) to provide financial support for the organization’s fourth annual Spring Chamber Music festival series of free concerts. Classical Up Close is a cooperative effort by musicians of the Oregon Symphony Orchestra (OSO) and community partners to offer free chamber music concerts — performed by musicians from the OSO and select musician friends — in venues around the Portland metro area. Visit CLUC’s website for more information about the 2016 series at: www.classicalupclose.org. The mission of The Oregon Community Foundation (OCF) is to improve life in Oregon and promote effective philanthropy. OCF works with individuals, families, businesses and organizations to create charitable funds to support the community causes they care about. Through these funds, OCF awards more than $60 million annually in grants and scholarships. The foundation makes grants through an application process that involves local citizens in the review and evaluation of requests for funds. Application materials are available through the Foundation’s Portland office.